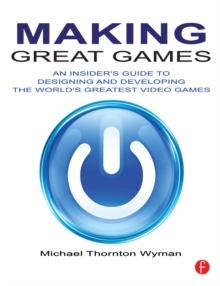 Join videogame industry veteran Michael Thornton Wyman on a series of detailed, behind-the-scenes tours with the teams that have made some of the most popular and critically acclaimed videogames of the modern era. Drawing on insider's perspectives from a wide variety of teams, learn about the creation of a tiny, independent game project (World of Goo), casual game classics (Diner Dash, Bejeweled Twist), the world's most popular social game (FarmVille) as well as the world's most popular MMORPG (World of Warcraft), PC titles (Half Life 2) to AAA console games (Madden NFL 10), and modern-day masterpieces (Little Big Planet, Rock Band, Uncharted 2: Among Thieves). Hear directly from the creators about how these games were made, and learn from their stories from the trenches of videogames production. This book is an excellent resource for those working directly on game design or production, for those aspiring to work in the field, or for anyone who has wondered how the world's greatest videogames get made.